John Heart won the Light Heavy & Overall title of INBF Mr. America in 2013 at 48 years-old. John was the oldest ever Mr America! John Heart (@MrAHeart and Insta: @mraheart) is a renowned trainer and teacher within the fitness industry. He is also a Natural Pro Bodybuilder who has won the title of Mr. America and Natural Mr. Universe. His primary platforms used for training/teaching include in-gym, YouTube, and all forms of social media including Facebook. John currently trains in-gym clients in Los Angeles, California and manages his online presence through MrAmericaHeart.com. He is also the official online trainer of Mike Mentzer’s Heavy Duty Training System. 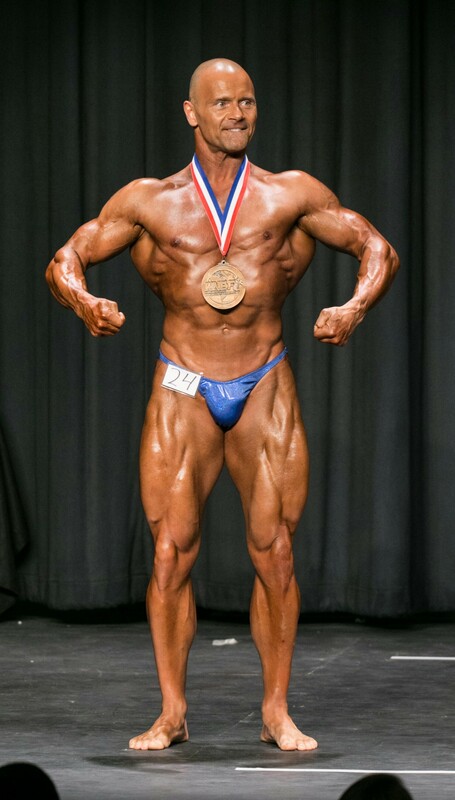 2013 – Secaucus, New Jersey: Won the Light Heavy & Overall title of INBF Mr. In this episode we dig into the details of John’s pre-bodybuilding contest routine in tremendous detail including exercise routines, protocol, and diet. I was waiting for this interview since the time it was announced to be under way and it was more that wothed…as I expected and then some more!! 1. RECOVERY shall always be the focus! Extensive Stimulus/Fatigue will never be the answer; If you need to go as hard as possible, Do so only if you keep the fatigue in check! Thank you for your contribution Kamen :D. I agree with practically everything you say below and most of John’s views, especially regarding training. I think some of the pre-exhaust stuff might be unnecessary based on some of the literature, but John is far more experienced than I in the practice. I probably differ on diet just because I prefer 2 large meals and doing intermittent fasting. I do think the macro-nutrients matter though and fat and protein should be optimised for muscle retention and mitochondrial health, and as a result, carbs tend to be on the low side for me, since they seem the least useful ;-). I’m also highly skeptical regarding the electric muscle stimulation but John is also. Overall, John admits that much of what he does isn’t underpinned by scientific evidence, but he believes it will give him an edge or possibly subtract from his performance if he removes it. All power to him. Hey Lawrence, I got so inspired by the interviews of Mr. Asanovich and John Heart, so that I decided to modify my current workout protocol, to coinside with the Mike Mentzer’s Ideal Routine principles and give it a try for some time. I had done Mike’s Ideal Routine back in the past as perscribed in his book “Heavy Duty The Mike Mentzer’s Way” with very good results. After about an year though, similarly as John Heart, I got cought up again with the typical Bro stuff and lost some precious time doing useless BS. The Ideal Routine is in essence a four way split – 1. Chest-Back, 2. Legs, 3. Shoulders-Arms, 4. Legs – Repeat. Each workout is followed by 4-8 days of rest, depending on one’s personal status. Almost each muscle group is trained with a superset of one pre-exhaust(single joint) and one compound movement, done to failure in the mid rep range 6-8, with only the legs being an exclusion – 10-15 rep range. 2. At this point of my training career, I see no need for direct Arms work, so there will be none included. That is another reason I’ll drop the pre-exhaust out. I need balanced lodaing from the compound movements. 5. Abs – flat bench(legs on the floor) plane bench crunches with weight. So in effect, systemic recovery stays in check with low session volume/low frequency. Local muscle recovery stays in check as “two weeks” blocks between direct work per muscle group will be employed as suggested by Mike Mentzer. (By the way I have read analysis of Mike’s program by russian scientists, who recognized, that indeed some muscle damadge recovery processes in the muscle tissues actually do take up to 14 days to be completed!) In addition, when muscles are trained so infrequently, they do become somewhat deconditioned to the load and exercise. They are not smaller or weaker, but are deconditioned. This may not be a bad thing and can be used IMO, as everything is realtive in life. Such a training scheme may ensure, that the exercises we have selected will be “working as proper stimulus” for us longer (we will not get used to them, build skill etc.). And whatever we gain as strenght or size will be more likely due to actual body development, rather than skill and/or other temporary exercise effects. Because in the end there are only so many exercise selections per each muscle, that are effective, efficient and safe. Really appreciate you sharing this here Kamen. I think people will find it very useful.